China SinoTrailers has over 10 years‘ experience in design and manufacture SPMT, also known as self-propelled modular transporter. It is a kind of hydraulic platform trailer equipped with powered diesel engine to drive itself to move, lift and steer, no need help of tractor or prime mover. L2.0, L2.29 and L2.4 SPMT are our newly designed industrial modular transporter. As a batch of next generation self propelled transporter, S2.0 has the lowest profile to 530mm, pretty low height for transfer in factory plant, highly maneuvrability and capacity up to 60 tons enable you to have efficient transport. Compare to conventional SPMT, L2.0, L2.29 and L2.4 have more concise design, which means lower cost and easier maintenance. Chassis frame, adopts Q690 high tensile steel, high safety factor. Hydraulic pendulum suspension set, consists of pendulum arm, lifting cylinder, axle (normal axle, drive axle and brake axle) and tire (solid or pneumatic industrial tyre). Hydraulic lifting system, 3 or 4 points supporting system, equipped with backup safety hydraulic line, make sure cargo and SPMT stable if any leakage happened. Power system (Power Pack Unit), supply power for lifting, moving, steering, braking and illumination. Driving system. Hydrostatic pressure came from PPU to hydraulic motor and cylinder to power the SPMT. Drive axle mounted with Rexroth reducer. Steering system. Mainly has two steering ways, one is mechanical steering, using tie rod for steering, max. steering reaches up to 50 degrees. Another is hydraulic and electronic steering, adopting rack and pinion on each suspension, steering angle is over 130 degrees, could make the SPMT move to any direction you need, even to move laterally like crab. The system embedded with angle sensor to monitor its running, and guarantee precise steering. ASR system. Embedded electronic control system make sure each wheel spin in same speed, and no slip and skid when the SPMT accelerates. Braking system. Different with modular trailers using air pressure as power to brake, the China SPMT adopting hydraulic pressure and cylinder to realize accurate braking. Circuit system. Power whole SPMT’s lighting system, could be LED illumination to maintain long working hours. Control system, with wire control panel and wireless control panel. 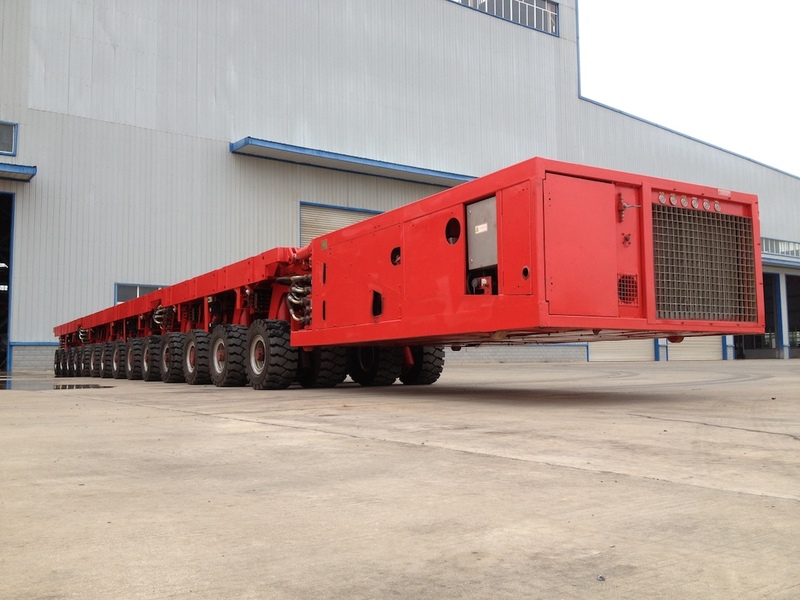 Self-propelled modular transporter is widely used as a perfect solution to transport modules such as, oil platform rigs, factory modules, chemistry vessels, nuclear reaction tower, harbor crane in shipbuilding, high speed railway bridge construction, wind mill construction, offshore modules (load in/out), harbor logistics, and other engineering logistic projects. Industries like construction, chemical engineering, refinery, metallurgy, ocean engineering, conventional energy (oil and gas) and eco energy all have increasing demand on SPMT. 1. Tie rod steering type (hydraulic and mechanical steering) . Non-driving axles module is hydraulic modular trailer, max steering angle is around 50°. 2. Independent suspension type (electronically and hydraulic steering). Max steering angle is up to 130°, this type SPMT can move sideways like a crab. Height and angle of PPU is adjustable, to adapt different working conditions. Even to disassemble PPU and put it on top of China SPMT to reduce total length, then get high trafficability, enable its efficient move in hairpin turn or narrow space. When preset a working program (moving and steering mode), China SPMT can work automatically. All kinds of China made SPMTs, compatible with Scheuerle, Goldhofer, Cometto, Kamag and Nicolas. SPMT parts, able to replace parts of original SPMT made in Europe. 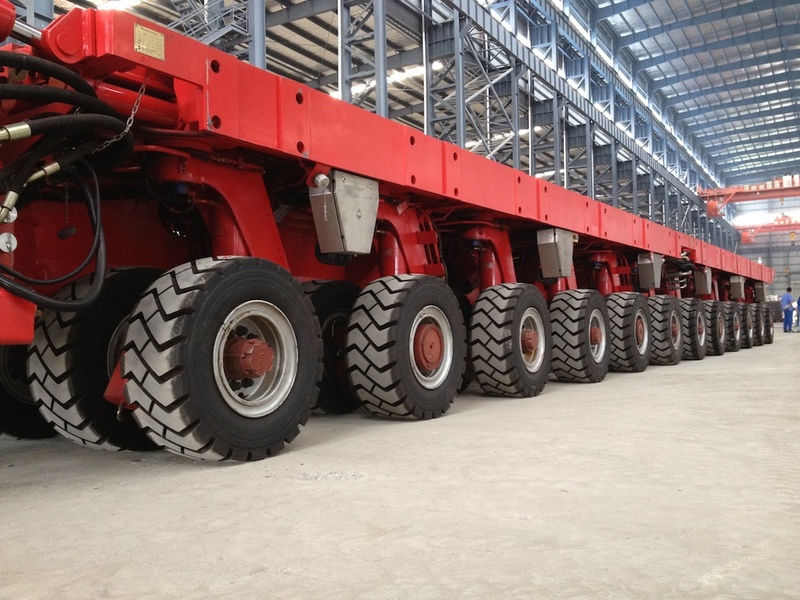 Upgrade hydraulic trailers to SPMT. Service of door-to-door refurbish of SPMT. Door-to-door service of replacing malfunctional parts. SPMT operator training and out-sourcing service. 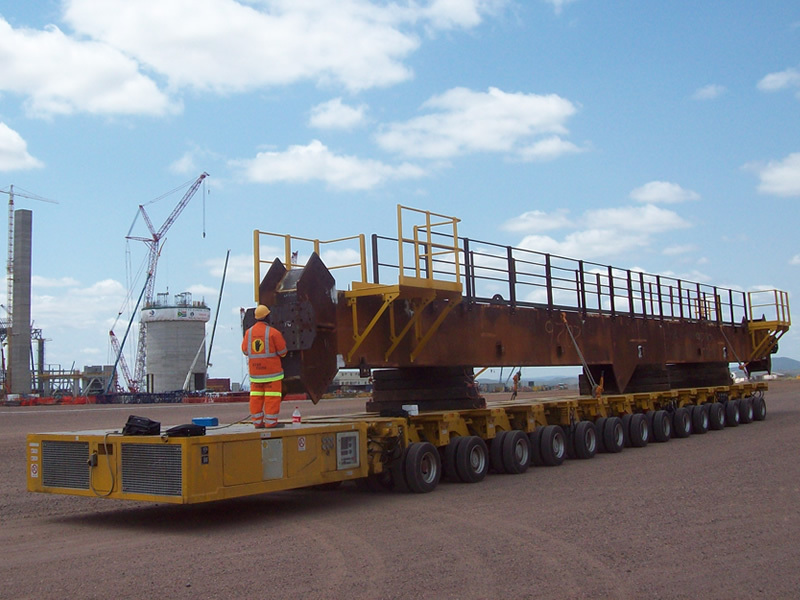 Want to move hundreds tons’ cargo for long distance road transport? You probably need modular hydraulic axle trailer.